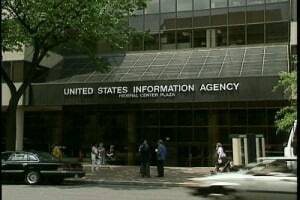 Before being absorbed and restructured by the State Department in 1999, the United States Information Agency (USIA) was an independent agency devoted solely to public diplomacy: dealing with the media, culture, and academic and professional exchanges. Considered by some America’s propaganda agency, its methods spanned broadcasting, printed materials, art exhibits, concerts, and above all, face-to-face personal interactions to communicate information about America’s policies, society and culture. 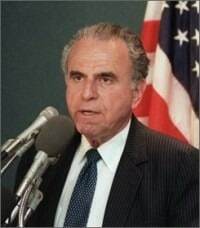 Charles Z. Wick, a close personal friend of Ronald Reagan, was appointed the director of USIA in 1981 and served until 1989, setting a record for length of service in that job. A former talent agent and film producer, he served through both of President Reagan’s terms and pioneered a more assertive image for the agency. 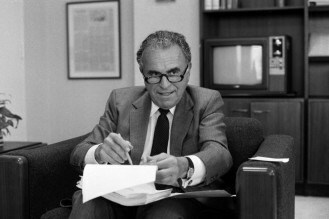 He was responsible for launching USIA’s WORLDNET, the first live global interactive satellite program, creating the Artistic Ambassador Program and establishing VOA broadcasting to Cuba under “Radio Marti.”He spoke out often about the Soviet Union and viewed the USIA as another tool in America’s arsenal for the Cold War. He was credited with adding substantially to USIA’s budgetary and personnel assets, but his volatile personality created rifts within the agency and made him the target of media scrutiny. He died nine years after leaving the agency at the age of 90. Joseph D. O’Connell, Jr. tells of his long and often challenging experience working directly with Wick as his Acting Director for Public Affairs from March of 1981 until December of 1988. 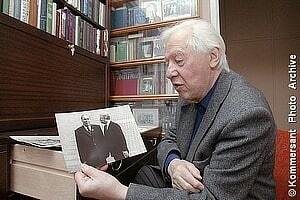 He was interviewed by Charles Stuart Kennedy in December, 2011. Please follow the link to read more about public diplomacy, the Cold War and others with ties to the entertainment business. Go to Moments in U.S. Diplomatic History. [The 1980 presidential election] election turned out to be a watershed event for USICA [the agency’s name had been changed to the United States International Communications Agency under President Carter]… In from California came a short, flamboyant friend of the new President named Charles Z. Wick (the “Z” was a remnant of his birth surname, Zwick, which he had changed to Wick years before. He would explain later that in his show business career, it was better to have a name that was “a little easier.”). Wick had raised a lot of money for Reagan’s campaign and he also chaired Reagan’s first Inaugural Committee. Wick liked to say that the President-elect had asked him what job he wanted in the new Administration. Wick said the only job he wanted was the ICA (USIA) Director’s job because, he said, “telling America’s story to the world’ is the most important job in government”…. During his Senate confirmation hearing, he said that the first thing he would do after being sworn in would be to remove the USICA sign on the front of the Agency’s headquarters building and re-hang the USIA sign whose subtitle had read “Telling America’s Story to the World.” He did just that. Wick’s arrival at USIA in the spring of 1981 signaled the start of an eight-year ride, the likes of which I had not experienced in my previous years with the Agency and which I would not experience again in the years after he followed Reagan back to California. For all of Charles Wick’s ups and downs while in Washington, his tenure at USIA was arguably the high point in the United States’ public diplomacy efforts. Wick earned a bachelor’s degree in music at the University of Michigan (where he had his own dance band) and studied law in Cleveland at what was then Western Reserve University. He never practiced law but became involved in show business early in his career. He was musically talented and played the piano decently (I heard him play once at an early Agency gathering. Later, Wick appointed his piano teacher to establish and head the Agency’s Artistic Ambassadors program, a fairly successful effort to send young American pianists overseas to perform). 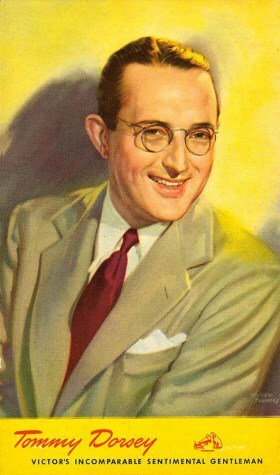 While at Michigan in the 1930s, Wick caught the attention of swing band leader Tommy Dorsey, who would from time to time fly him to New York to do musical score arrangements for the Dorsey band and to coach the band’s vocal group. Later, he worked for the William Morris talent agency in New York, where he represented Peggy Lee and Benny Goodman. When Dorsey moved to California, Wick did, too. It was during the Carter Administration that, as Wick would later tell journalists, he began to feel that “something needed to be done to save the country.” He became active in GOP circles, especially among major contributors to the party, and, along with other like-minded Republicans, began to envision Ronald Reagan as their standard bearer at the national level. 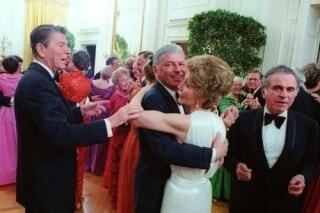 He also served as co-chairman of Reagan’s first presidential inauguration committee. 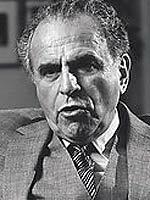 Early in Reagan’s first term, Wick was a member of the President’s so-called “kitchen cabinet” of informal advisors, along with California businessman Justin Dart, department store heir Alfred Bloomingdale, future Defense Secretary Caspar Weinberger, Paul Laxalt, Edwin Meese, among others. He had been a longtime businessman, and he came to the Agency armed with some predictable chestnuts about government workers and public service, e.g., government workers have never met a payroll; they can’t be fired; they’re unimaginative and risk-averse, etc., which were very much in line with Reagan’s thinking. Wick saw his mission as energizing USIA. Charles Wick was far from being a rube or unintelligent. He could also be tough to please. Wick was not particularly political in the sense that he was not an ideologue and seemed to have little interest in right-wing politics per se. 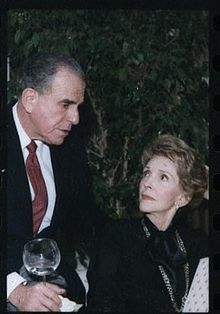 Rather, his interests lay in unflinching loyalty to Ronald Reagan and his agenda and in finding ways to make USIA responsive to and supportive of the ideas and policies of Ronald Reagan, even though it was never entirely clear how that was going to happen with an entity whose work was nearly all done overseas and which was at that time prohibited by law from operating in the United States (the thinking being that an information entity might one day be used by a nefarious administration to “propagandize” Americans at home.) I was never sure what that thinking said about the agency or its work overseas. Following the lead of President Reagan, Wick spoke out frequently about what he regarded as the menace of the Soviet Union, and, he added later, the urgent need to bring the assets of the Agency to bear in combating Soviet propaganda and disinformation. I started by writing speeches, which was an interesting and challenging exercise. Wick had never given set speeches and really did not know what to do with a speech draft, but his staff — and eventually he, too — always insisted on having an advance draft. He would often begin his remarks by holding up a sheaf of papers and telling his audience that he had been given the pages about what to say but that he really did not want to use it. Nonetheless, I had to produce speech texts no matter what, a process which brought about considerable back and forth with him and his staff. Speaking of his speeches, Wick, knowledgeable about show business as he was, would always — typically as he was being introduced and could look out at his audience — count the house. I learned early, whenever he would ask how many people I thought were in the audience, to estimate low rather than exaggerate, for he would always have a far better idea of the audience size than I did. With his experience in show business, Wick believed that he was his own best public affairs person. While that did not work out very well when he was still new and trying to establish his public persona, he did, after a fashion, grow into the job, especially during the second Reagan Administration. From the time Wick arrived at the Agency, he hired what turned out to be a long series of political appointees to head the public affairs office. Although a few of his public affairs directors had some experience, most did not. In the end, none of the appointees could cope with him, and he repeatedly fired them. During his eight years at ICA/USIA, he parted ways with eight or ten of these people — I’ve lost count — regularly and rapidly. In all of those instances, I became the acting director of the office, so it would fall to me to break in the new appointees. As time went on and as the latest public affairs incumbent began to wear out his or her welcome, Wick would use me as the advance person before firing them. A sure sign that he was about to show someone the door was when he and his special assistants would start to deal with me directly as they iced out the hapless and usually unsuspecting office director. My position in these circumstances was often uncomfortable, since on more than one occasion, the incumbent had already guessed that he or she (there was one woman) was in trouble. One early candidate for the public affairs job, a former FSO [Foreign Service Officer] with the Agency, literally lasted a half a day. In the fellow’s initial, chilling interview with Gilbert Robinson, Wick’s first deputy director, Robinson told him that working for Charles Wick was like having a bank account with a small opening balance. Each mistake would constitute a withdrawal, and no new deposits could be made. Once a zero balance was reached, he or she would be gone. With each of these departures, Mr. Wick, either in a quick phone call or after summoning me to his office, would tell me that I would (again) be the acting office director until he found someone else. I was soon able to predict whether and how long someone would last, so I was never surprised when new incumbents suddenly were not there anymore. He was something of a visionary, particularly with satellite television. 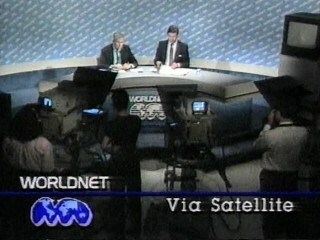 WORLDNET was the name he gave to the Agency’s satellite television operation. Wick did not start TV at USIA. It had been there for years, but he had a single-minded notion, which seems obvious in retrospect, that satellite-borne television programming was a largely untapped resource that could be used to great effect in the Agency’s public diplomacy work. He was right. WORLDNET’s best known and probably most effective programs were the live “interactives,” or interviews of top U.S. officials in Washington by foreign journalists who would gather simultaneously at several U.S. missions overseas. These were unrehearsed and no-holds-barred exchanges that would then be broadcast in both the countries where the journalists were and, depending on the topics being discussed, other countries in the same region. With his Administration-wide clout, Wick was able to line up and lock in high officials, including cabinet secretaries. The electronic dialogues took off and became a staple of USIA’s public diplomacy work. If Wick was a visionary, however, he could also be his own worst enemy. As smart as he was, he exhibited in the early going the visceral mistrust of government employees that I mentioned. I used to wonder if that might have been a cover for his fear that career people, especially Foreign Service Officers, might be not taking him sufficiently seriously and that they might have regarded him as a Babbitt-like hack and clueless pal of Ronald Reagan. He of course would never have admitted it, but I believe that he did overcompensate by displaying a persona that could quickly run to the unpleasant. As with most cartoonish characterizations, there was some truth to them, but Wick was far more complex than most people gave him credit for, which was not unlike the perceptions many had of his friend, Ronald Reagan…. Wick also loved to squeeze humor from foreign-sounding diplomat-speak. He would, for example, often quip when the word denouement would come up, regardless almost of whom else was in the room, including foreign journalists or diplomats. His laughingly delivered comment on denouement would be something like, “Whatever happened to denoue-DAD?” I learned not to cringe at the blank expressions that his question would often produce. He loved to make frequent use of anti-Soviet humor in his remarks. I kept a stack of large index cards (this was largely in pre-computer days) on which I would keep examples of that brand of humor. I recall devoting considerable time to searching for new anti-Soviet jokes, which I would dig up here and there and which would usually delight him, especially if they exposed the frailties and contradictions of the Soviet system. One that I recall went as follows, “Did you hear the one about the cardiology ward on the fifth floor walk-up of hospital number 26 in Moscow?” Another one talked about a Soviet citizen who was walking along the street one day, holding two empty shopping bags, and she suddenly could not remember if she was going to the market or whether she had just left the market. 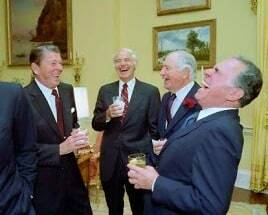 Wick often said that he shared the anti-Soviet humor with President Reagan…. Wick’s humor could appear cruel. More than once, I saw him, usually at staff meetings, present an award to an Agency officer. He would typically praise the recipient lavishly and describe how valuable the person’s hard work and advice had been. Then, when it appeared that he was finished, he would pause for a couple of beats while the award recipient would beam and receive the applause of his or her colleagues. 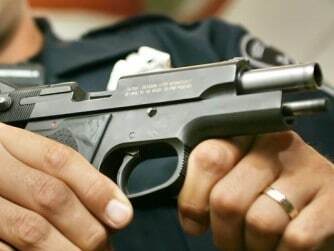 Wick would then turn to the just-praised officer and say, “Oh, and one more thing, you’re through.” The first couple of times he did that, there would be a stunned silence, with the award recipient wondering what was going on, until Wick would display his toothy grin, and the whole room would laugh uneasily. Instances like that one — and they happened frequently — used to remind me of the testimonial dinners often shown in movies about the Mafia, in which one of the underbosses would be praised and showered with love, only to get the baseball bat over his head afterwards, or other similar film scenes in which pals would stand up and utter words of praise for the capo de tutti capi, or everyone in the room would be trying to impress the boss and laugh loudest at his jokes, hoping that he would not get up and start swinging the bat in their direction. An extra thick skin was a valuable asset for anyone working for Charles Wick. [Wick had problems with the media], especially in his early years at USIA, during the first Reagan Administration, he invited and was an easy target for ridicule, with his flamboyance and $1,000 Savile Row suits, wonderful malapropisms, and rookie faux pas. The major media outlets, notably The Washington Post, skewered him gleefully in those years. The titles of two Post pieces during illustrated the kind of media attention Wick was attracting: “The Wick Whirlwind: Reagan’s ICA Chief Brings Hollywood Hustle to Washington,” (5/11/82) and “Wick Adds Flair to U.S. Story: Hollywood-Style Diplomacy,” (7/13/83). During Wick’s first four years at the helm of USIA, there was one gaffe or self-inflicted crisis after another, with accompanying media coverage. It is probably safe to say that, especially in his first months and years in office, Wick often had a difficult time making himself understood. One of his earliest missteps came in October 1981, when he began a meeting of the National Council of Community World Affairs Councils by — apparently dramatically — proclaiming, “We are at war.” His later explanation that he was only referring to a “war of ideas” with the Soviet Union probably did little to calm the concerns of the cultural and educational exchange community. But by far the biggest of the early flaps, coming also that late 1981 busy season, which the Washington Post covered heavily, concerned allegations that Wick was intent on politicizing the Voice of America. He brought in a Falstaff-like former public relations man and ex-editorial writer at the conservative Washington Times named Phil Nicolaides to look at VOA, an assignment that was apparently unknown to the Reagan Administration’s first VOA Director, an avuncular former CBS Records and Bonneville Broadcasting president named Jim Conkling…. The memo was leaked to Murrey Marder at the Post (VOA Director Conkling insisted that the memo had been stolen from his office) and became an instant sensation at VOA and beyond. Wick may not have realized it, but any designs that he may have had on the Voice of America had just come to a stop, even before they got started. Then as now, it does not take much to stir up VOA employees — they come to work stirred up — and any hint that the news independence of the Voice is being tampered with is more than sufficient to bring about something like open revolt. Wick next made news when, believing that he might be a target of the KGB, he had a $32,000 security system installed on the Agency’s tab at his home off Calvert Street, N.W., in Washington. White House aides reportedly saved the president from possible embarrassment by persuading Wick to reimburse the government for some $22,000 of the cost (and, apropos of security and alleged threats from the KGB or others, Gilbert Robinson, Wick’s hapless and mean-spirited first deputy director, was said to have persuaded Wick to accompany him to a Washington-area shooting range for some target practice with a Glock automatic. Then, on the eve of one of Wick’s first overseas trips, the USIA security people persuaded him to wear a very heavy, bullet-proof overcoat during his stay in Berlin. I was told that Wick, who was of short stature, tried the coat on just once and told Robinson that it was simply too heavy for him. The garment was then hung in a coat closet at USIA, apparently never to emerge again. For all I know, it is still there…. [There were allegations that Wick secretly recorded his phone conversations] and New York Times columnist and language guru William Safire, along with his Times associate, Jane Perlez, jumped on the story. In late December 1983, they reported that Wick, a la Nixon, had been secretly — without obtaining the consent of the people with whom he was speaking — taping his phone conversations in his office at USIA headquarters. Safire was already a foe of secret recording since his time in the Nixon White House during Watergate, nearly a decade before, but there was also something else that whetted his appetite for the story: he did not like Charles Wick. So, as President Reagan’s second Administration got under way, Charles Wick appeared to have triumphed over his earlier critics. Thanks to him, or so it seemed, his agency was at long last on the map and beginning to matter in Washington. Wick viewed overseas travel as a big part of his job…. Wick did get some flak for his travels, specifically allegations that he required an entourage while traveling and that U.S. embassies were required to make extensive preparations for his visits. Some of that was exaggeration, but much of it was also true. It was true, for example, that he did demand top treatment, including a full schedule of appointments with the most senior officials of the countries he was visiting, up to and including the heads of state or government, ministers of information culture, whom he regarded as his equals. It is also true that, whether for his overseas travel or for appointments in Washington or media and public speaking events anywhere, Wick required enormous preparation, including copious amounts of briefing material in large binders that had to be toted everywhere by staff people. The books would have everything about the engagement, from the location of the rest room to the name of the wife of the president, to everything in between. In the second term, Wick started traveling to the Soviet Union where he established a relationship with the aforementioned senior Gorbachev advisor named Zamyatin. He also saw other officials, such as the famed Georgy Arbatov at the Institute for the USA and Canada and people at Radio Moscow, but it was with Zamyatin that Wick started and continued discussions about the media exchanges between the U.S. and the USSR that figured so importantly in his being taken more seriously by the U.S. media. With the advent of Glasnost, and the opening up of relatively constructive U.S.-Soviet dialogue, Wick was able to achieve some gains, some more important than others. 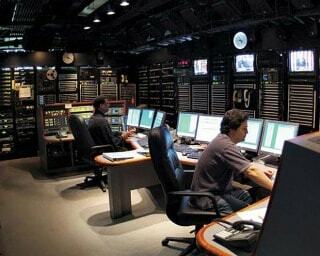 For example, he reached an agreement with the Soviets under which they would stop jamming the Voice of America. Another agreement permitted greater circulation in the Soviet Union of America Illustrated, USIA’s hugely popular, Life-magazine-size publication. In return, the Soviets could increase the U.S. circulation of their drab equivalent, the English-language Soviet Life, which was virtually invisible in the U.S.
Again, Charles Wick could be and often was his own worst enemy. For example, he got himself in trouble when testifying before the House Foreign Affairs Committee about the reach and audience size of WORLDNET. He rightfully claimed credit for bringing WORLDNET into the satellite age and for making it the important public diplomacy tool that it became, but, either because of a misstatement or because he actually believed it, he wildly exaggerated the number of people that it reached. During a hearing, he came up with a number of viewers that was so enormous that one Committee member was moved to say, “Wait a minute, Mr. Wick, that’s more people than there are in the world.” It was a famous exchange which was duly covered. Wick was momentarily embarrassed and eventually backed off that claim. Many of the people who were his most severe critics have admitted in retrospect — mostly positively — that there had never been a USIA director like Charles Z. Wick. I don’t know if he would have agreed with that, but it was clear that he did grow into his job over time. Did he end up being a peerless statesman? Of course not. He would have laughed at that thought, but he was a far better Director when he left the Agency — and much more mellow — than he was when he started out. When Wick came to the Agency in 1981, he had a somewhat skewed notion of USIA’s capabilities and what it actually did, and he tended to focus on the information side. With time, however, he came to gain an understanding of the exchange programs and their power to being about enhanced understanding of the U.S. He also grasped that the figures showing how many world leaders has been introduced to the United States through the International Visitor (IV) program gave him some excellent bragging material, and he used that example frequently in public remarks. 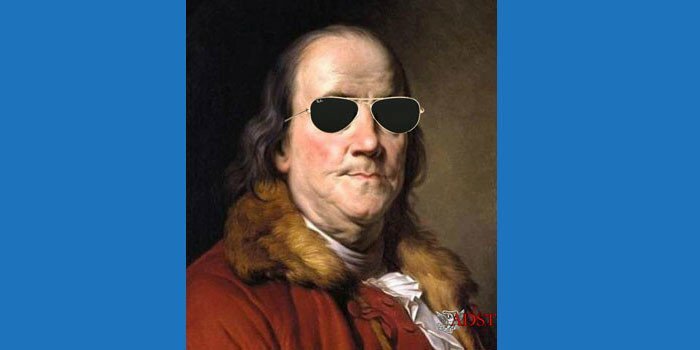 He kept in his pocket a list of the 100 or so current world leaders who had come to the U.S. at an early age thanks to the IV or Fulbright scholarship programs). He loved to say, for example, that Margaret Thatcher had come to the United States as a young woman on one of the Fulbright familiarization tours, and I am sure he reminded her of that when they met…. I believe [historians] will render a mixed judgment of Charles Wick’s years at USIA. He had started slowly and moved from an object of early ridicule to one of near respect in the second Reagan Administration — if grudgingly so on the part of some. As far as his approach to his Soviet counterparts, I would not go so far as to say that Wick’s final few years in office were a succession of enduring triumphs, but he at least got some useful conversations going in those Glasnost years. Sadly, yet tellingly, neither he nor his patron Ronald Reagan were around at the time that USIA was eliminated in 1999…He brought to the Agency a level of respectability in the U.S. foreign affairs community — brief though it was — that it had not enjoyed in its entire history.